The understanding of federalism varies from country to country, however, there are certain basic principles inherent in all federal systems that makes it easy to identify a country that practices federalism. The most cogent, clearly expressed and the most acceptable definition of federalism is that of Kenneth C. Wheare. a) There must be at least two levels of governments and there must be constitutional division of powers among the levels of governments. b) Each levels of government must be co-ordinate and independent. c) Each levels of government must be financially independent. He argued that this will afford each levels of government the opportunity of performing their functions without depending or appealing to the others for financial assistance. d) There must be Supreme Court of the independent judiciary. He argued that in terms of power sharing, there is likely to be conflict hence, there must be independent judiciary to resolve the case. e) In terms of the amendment of the constitution, no levels of government should have undue power over the amendment process. He maintained that, once a country is able to satisfy these conditions, such country is said to practice federalism. The federating units (states and community governments) maintain autonomy over the most basic issues that affect their people. From security to education, resource control, taxes, infrastructural developments, elections, judiciary, health care, etc. Powers are shared between the various tiers of government in a manner that unnecessary interference becomes impossible. The government (tier) closest to the people is more empowered to meet up with the needs of the local people. The federal national government is usually a creation of the sub-national (state) governments. The federal government responsibility is usually limited to just foreign affairs, monetary policy, immigration, customs, defense. Al powers not expressly given to the federal government by the federal constitution is reserved for the state government. Governance is run in a bottom-up approach. In short, in a federal system, there is no hierarchy of authorities, with the central government sitting on top of the others. All governments have a horizontal relationship with each other. The power sharing arrangement should not place such a preponderance of power in the hands of either the national or regional government to make it so powerful that it is able to bend the will of the others to its own. Federalism presupposes that the national and regional governments should stand to each other in a relation of meaningful independence resting upon a balanced division of powers and resources. Each must have powers and resources sufficient to support the structure of a functioning government, able to stand on its own against the other. From the separate and autonomous existence of each government and the plenary character of its powers within the sphere assigned to it, by the constitution, flows the doctrine that the exercise of these powers is not to be impeded, obstructed or otherwise interfered with by the other government, acting within its powers. Is Federalism Compatible with Nigeria’s Heterogeneous Nature? Any experiment with a unitary constitution in a bilingual or multi-lingual or multi-national country must fail, in the long run. It is surprising that Nigeria only operates federal system on paper. The federal structures have never existed in Nigeria society. The reasons are not far fetch; First, the federal government, ever since the intervention of the military in government has always assumed superiority over the state government, Because military federalism had been more common than civilian federalism, this model made the federal government the ‘‘master in relation to the dependent’’ state governments. At independence largely autonomous regions possessed the residual powers in the federation and functioned almost independently and efficiently. The regions had independent revenue bases; separate constitutions, foreign missions, and the primary and secondary education were under the residual list while the university education was under the concurrent list. All these changed under military rule. Attempts by the state governments to reassert their autonomy during the second republic were aborted by the return of military rule. Let us now take a review of Nigeria’s past experience with federalism and see how compatible it was. Each Region had its own separate Constitution, in addition to the Federal Government Constitution. Each region had its own separate Coat of Arms and Motto, from the Federal State or Government. Each Region established its own separate semi-independent Mission in the U.K. headed by ‘Agents-General’. The Regional Governments had Residual Power, i.e., where any matter was not allocated to the Regions or the Federal Government, it automatically became a matter for Regional jurisdiction. Separate Regional Judiciaries and the power of the Regions to establish, not only High Courts, but also Regional Courts of Appeal. The Regions had their own separate electoral commissions for Local Government elections. However, the Chairman of the Federal Electoral Commission was the statutory Chairman of the State Commission. The Revenue Allocation system under the 1963 Constitution was strictly based on derivation. It will be observed that Mines, Minerals, including oil fields, oil mining, geological surveys and gas were put in the Exclusive Legislative List in the 1960 and 1963 Constitutions. This was a carry over from the provisions of the 1946 Minerals Act, under which the Colonial Government gave itself the exclusive ownership and control of all minerals in Nigeria. This was understandable under a Colonial Regime whose objective was the exploitation of the colonised peoples, but certainly not acceptable in an independent country constituted by autonomous (Federal) Regions. It is, therefore, not surprising that what was lost by placing mines, minerals, oil fields, etc., in the Exclusive Legislative List, was regained by the very strict adherence to the principle of derivation in the revenue allocation formula, particularly the allocation of the proceeds from mineral exploitation. Did Nigeria make progress under the short lived federal system? Omoh Gabriel, a journalist described the period of Nigeria’s federalism as such; NIGERIA after Independence was on the right path of economic growth and development. It had visionary leaders who were interested in the welfare of the people. Industries were springing up in every region of the country. In the North, Ahmedu Bello who held sway was occupied by setting up farm settlements, textile industries. It was the same story in the East where Michael Opera set up farm settlements and a number of manufacturing companies. In the West, Chief Awolowo, apart from the popular free education, set up a number of industrial estates which attracted several companies from abroad. It is this simple reason that the West is the most industrialized part of the country. At this time, the Nigeria economy was in top shape and at take off stage in economic development. The Nigerian economy was rated along the same indices with Brazil, Indonesia, Malaysia and the rest of the now talked about BRICKS countries. Then Nigeria had development plans that guided the nation. In the North pyramids of groundnuts and cotton were part of foreign exchange earning commodities. In the West, cocoa was found in abundance. It brought pride to the nation. The various regions were autonomous entities and there was competition among the regions on internally generated revenue. The military intervention and the discovery of crude oil in commercial quantity seemed to have radically altered the course of Nigeria’s economic development. While the military discarded the fiscal federalism structure of the country and made the states to become federal allocation collector, the discovery of oil made Nigerian leaders to sleep walk and refuse to plan believing that the money flowing from the ground will solve all the nation’s problems. As the military leaders were sleep walking and basking in the euphoria of petrol dollar earnings, Nigeria’s population was growing faster than the resources. From the foregoing and from historical accounts, we can see that federalism is not just compatible with Nigeria but has equally worked i the past until it was discarded by the military. What System Does Nigeria Currently Operate? Judging from the historical accounts and and structure of our present system, we could say for sure that Nigeria does not practice a federal system even though it claims to be a ‘federal’ republic. What Nigeria practices in reality is a unitary system. In a federal system for example, the federal government does not create the states government, rather than it is the autonomous state government that come together to establish a federal union. Also, in a federal setting, the central authority does not sustain the states by giving them monthly allocations as it is in Nigeria. Rather, it is the central government that derives its sustenance from the states. The following attributes in our present system shows that we are not a federal republic but a unitary republic. In a federal system, the states are autonomous creations and the federal government is a creation of the states. In Nigeria, the states are the creations of the federal government and must therefore sustain them until it can no longer do so. Autonomy in a federal system means that the states are able to manage its affairs without interference from the central government. In Nigeria, the states are unable to conduct their own elections, they have no control over their own security (there is no state and community police system), they have no control over their natural resources. They have no control over their basic education policies, they have no control over electricity distribution and generation. Their taxation base is limited, and many others. In a federal system, there is no such thing as monthly allocations to the states from the federal government. In Nigeria, reverse is the case. Because the federal government created the states, it has to sustain them! General Ironsi, emerged as the head of state after the first coup. Against all advice, Ironsi promulgated Decree Number 34 of 1966, which abrogated the federal system of government and substituted a unitary system; he argued that the military could only govern in this way. Given the already charged atmosphere, this action reinforced northern fears. As the north was less developed than the south, a unitary system could easily lead to southerners “taking over control of everything,” as a northern spokesperson put it. It was at the height of northern opposition to unitarism that the countercoup of July 1966 took place. The North wanted a return of federalism as the only way to guarantee their autonomy. The military government of Ironsi insisted on maintaining the unitary military system! Lieutenant Colonel (later General) Yakubu Gowon, became the head of state after the second coup. His first act was to reinstate the federal system, along with the four regions and their allotted functions. But relations between the federal government and the Eastern Region, led by military governor Colonel Chukwuemeka Odumegwu Ojukwu, were very strained. In September Colonel Gowon summoned an ad hoc constitutional conference to deliberate on the country’s political future. Most regional delegates to the conference, with the exception of those from the midwest, recommended a confederal system to replace the federal system. The delegates from the Eastern Region insisted that any region wishing to secede from the federation should be allowed to do so. The conference was ended abruptly by increased killings of Igbos in the north and the heightening of tensions between the federal government and the Eastern Region. A summit of military leaders at Aburi, Ghana, in January 1967 attempted to resolve the disagreements and recommended the establishment of a base confederation of regions. The Aburi Agreement became a source of contention, however. In anticipation of eastern secession, Gowon moved quickly to weaken the support base of the region by decreeing the creation of twelve new states to replace the four regions. Six of these states contained minority groups that had demanded state creation since the 1950s. Gowon rightly calculated that the eastern minorities would not actively support the Igbos, given the prospect of having their own states if the secession effort were defeated. The Gowon years also saw the oil boom and a buoyant economy. The federal government was encouraged to take on some responsibilities formally allocated to the states, especially in the area of education. The structure of government under Gowon was basically unitarian. At the apex of government was the all-military Supreme Military Council (SMC), which was the lawmaking body for the entire federation. Its decrees could not be challenged in any law court. Most members of the SMC under Gowon were state governors. There was also a Federal Executive Council composed of military and civilian commissioners. The states also had commissioners appointed by the governor. The states were practically reduced to administrative units of the federal government, which in several domains made uniform laws for the country. This basic structure of military federalism has, with amendments, remained the same during all military governments in the country and was transferred to the civilian government with its 1999 constitution. Nigeria has remained so till date; a unitary system. There are basically three revolutionary movements in Nigeria today and each of them have a different perspective on how to solve the Nigerian problem. The first group, lets call them the unitarians. They believe that there is nothing wrong with the present unitary system of Nigeria. What is wrong with Nigeria is Nigerians. There is a moral decadence that must be tackled, there is need for reorientation and values. Nigerians have become corrupt and have equally corrupted the political system. In summary, the unitarians believe that it is Nigerians that needs to be restructured and not Nigeria’s political system. The second movement; lets call them the secessionists. This group of Nigerians believe that Nigeria is in fact a lie and that a lie cannot be restructured! They admit that Nigeria is badly structured and they doubt that it can ever be restructured. So far, they have opted for a complete dismemberment of he union as the only way to save themselves, their tribe, communities and region. They want Nigeria dissolved because they fear Nigeria has never worked and will never work. The last group is where we belong here; the Federalists. The federalist movement believes that something is obviously and fundamentally wrong with Nigeria. After an interesting research, the federalist has reached the conclusion that what is wrong with Nigeria is the structure of its defective federal system and that the solution will be to restructure the country and entrench true federalism. The unitarians, secessionists and the federaists are now in a battle towards shaping the future of Nigeria. The future of Nigeria will be greatly determined by the success of one or more of these revolutionary movements. Can the Federalists with their Federalism fix Nigeria? From the foregoing discussion about the history of federalism in Nigeria, we can agree that the only period when Nigeria witnessed sustainable economic growth was during the short period of regional government based on federalism. Federalism brings competition, competition drives productivity, productivity inspires innovation, innovations drives development. This is exactly what Nigeria lacks; competition, productivity, innovation, efficient and sustainable development. The unitary system has not only distorted the necessary ingredients for growth but it has also entrenched an entitlement mentality in the populace and among the federating units, making them less aggressive towards self-sufficiency. Recent statistics has shown that over 95% of the federating units (states and LGAs) are not sustainable without federal allocations. What this basically implies is that if the federal government suffers a major economic sabotage in its revenue generating base, the entire country will likely run into crisis. In summary, Nigeria is in crisis because it was built on a faulty foundation whose existence is now threatened. Federalism comes with certain principles that guarantees sustainability of economic and political inclusive institutions. Nigeria does not have electricity today is not because she does not have the resources to have electricity, it is simply because of the centralization policy by law which forbids the federating units from competing, generating and distributing their own electricity without federal interference. And many others. How then will Federalism fix Nigeria’s problem? Federalism guarantees the autonomy of the federating units thereby making the centre (central authority) undesirable for local development issues. Under federalism, marginalization will become unnecessary as every state and community will be solely responsible for their own development or underdevelopment (its their choice to make). Federalism eliminates over-centralization of political and economic powers thereby empowering the local people and their communities to take charge of their own development. States will no longer have to depend on federal allocations to survive and local communities will no longer. Federalism has an in-built mechanism that promotes transparency and accountability. One reason why there is massive corruption in today’s Nigeria is simply because the people are not necessarily involved in the revenue generating process thereby making them less concerned about how the revenue is spent. The federal government simply ‘steals’ crude oil money from the people, collect customs taxes and goes about to spend it as it pleases. There is no real tax based revenue system where the people are expected to fund the government. As long as the crude oil keeps flowing, there is revenue for the government. This is the root cause of corruption in Nigeria. Federalism ensures that no tier of government has access to free natural resources without first going through the people who would then demand for accountability afterward. Under federalism, there is a bottom-up approach towards peoples relationship with the government. The local communities and their people control their resources and pays taxes to the various tiers of government. The communities and towns fund the state government and the state government funds the federal government. Each would naturally demand for transparency and accountability. In a nutshell, federalism will fix corruption in Nigeria! Federalism will bring a new ‘think home’ philosophy among Nigerians in diaspora. With every community having a community based government to handle its most basic needs, Nigerians in diaspora will be excited and willing to support their annual community based budgets for both recurrent and capital projects. Development will be centred around people and places. The local people and their communities will become the biggest beneficiary of a restructured Nigeria. Abuja (federal government) will no longer be blamed for the underdevelopment of the states and local communities. Everybody will simply be in charge of their own development. Like Professor Claude Ake once said, development is a process of social transformation in which the people themselves are in charge of the process. Federalism puts the needed economic and political powers in the hands of the local people and away from the politicians. When you hear the phrase ‘Restructure Nigeria’ and ‘True Federalism’ what comes to your mind? For many, ‘restructure’ and ‘true federalism’ have become a suspicious phrase. This is due to the misconceptions, misinterpretations, misunderstanding, and ignorant understanding of the concept. For some, true federalism means resource control and therefore should not be accepted. For others, restructuring means creating an opportunity for secession and must therefore not be accepted. These two major misinterpretations have greatly hindered the general acceptance of the concepts and have made it difficult for Nigerians across divide to accept it as a pragmatic solution. What then is federalism and restructuring and how is it different from what antagonists think it is. What is the relationship between federalism and resource control? If you have understood what federalism is, by now you should know that federalism is not resource control but however resource control is a feature of federalism. When you say a people should be autonomous, it also entails that they should have the right to control their resources too. This is a basic principle of federalism. You cannot give the local people more responsibilities and yet deny them access to to exploit their resources and take advantage of their comparative natural advantages. What exactly is Resource Control? The power and right of a Community or State to raise funds by way of tax on persons, matters, services and materials within its territory. The exclusive right to the ownership and control of resources, both natural and created within its territory. The right to customs duties on goods destined for its territory and excise duties on goods manufactured in its territory. Resource control, which in certain circumstances can be referred to as fiscal federalism, goes hand in hand with true federalism. This was recognized and implemented faithfully in the Independence and Republican Constitution (1960 and 1963). The Regional Constitutions, in the 1960 and 1963 Constitutions, described each Region as “a self-governing Region of the Federal Republic of Nigeria.” To buttress the self-governing status of each Region, adequate provision were made to guarantee the economic independence of the Regions, thus avoiding the hollowness of a declaration of self-governing status totally undermined by economic dependence. Moreover, consistently with the Federal character of the country, i.e. country of many nations, the basis of revenue allocation was strictly derivative. Section 140 which made provision for the sharing of the proceeds of minerals, including mineral oil, stated that: “There shall be paid by the Federal Government to a Region, a sum equal to fifty per cent of the proceeds of any royalty received by the Federation in respect of any minerals extracted in that Region and any mining rents derived by the Federal Government from within any Region.” For the purposes of this section, the continental shelf of a Region was deemed part of that Region. This is totally consistent with international law which characterizes the continental shelf as a seaward extension of the land of the coastal state. By Section 136(1) 30 per cent of general import duties were paid into a distributable pool for the benefit of the Regions. With regard to import duties on petrol, diesel oil and tobacco, the total sum of import duty collected less administrative expenses, were fully payable to the Region for which the petrol or diesel oil or tobacco was destined. A similar provision was made for excise duty on tobacco. With regard to produce, i.e. cocoa, palm oil, groundnuts, rubber and hides and skin, the proceeds of export duty were shared on the basis of the proportion of that commodity that was derived from a particular Region. As noted above, the derivative bases of the allocation of revenue and the proportionate share of such proceeds that went to the Region it originated from, clearly buttressed the operating base of. From the above historical account, we can see that resource control has been an integral aspect of Nigeria’s short lived federalism. What is the relationship between federalism and secessionism? Another popular misconception about federalism is that it will lead to the dismemberment of Nigeria. This is not true. In fact, a restructured Nigeria will lead to a united Nigeria as all issues of marginalization, exploitation and the likes been perpetuated by the federal government will be completely eradicated. This region shall have complete legislative and executive autonomy with respect to all matters except the following: defence, external affairs, customs and West African research institutions. That there shall be no Central Legislative body and no Central Executive or policy making body for the whole of Nigeria. There shall be a Central Agency for all Regions which will be responsible for the matters mentioned in paragraph one and other matters delegated to it by a Region. The Central Agency shall be at a neutral place preferably Lagos. The composition and responsibility of the Central Agency shall be defined by the Order-in-Council establishing the constitutional arrangement. The Agency shall be a non-political body. The services of the railway, air services, posts and telegraphs, electricity and local mining shall be organised on an inter-Regional basis and shall be administered by public corporations. These corporations shall be independent bodies covered by the statute under which they are created. The Board of the Coal Corporation shall be composed of experts with a minority Representation of the Regional Government. All revenue shall be levied and collected by the Regional Government except customs revenue at the port of discharge by the Central Agency and paid to its treasury. The administration of the Customs shall be so organised as to assure that goods consigned to the Region are separately cleared and charged to duty. Each Region shall have a separate Public Service! The above historical account explains everything we need to know about federalism and secession. Secession becomes unnecessary when autonomous federating units are in charge of their people and development. It is in fact, the present unitary system that breeds secessionism. There is a lesson from Ethiopia and their recent attainment of federalism that we should learn from. Let us put it here in verbatim. “…Politically, the era of centralization seems to have come to an end, and this is as it should be. A multi-ethnic, multi-lingual and multi-religious society such as ours cannot and should not be administered in a highly centralized manner. That people in their respective localities have the right to administer themselves, exercise a degree of command over their own resources, and develop their own cultures and languages must be taken as axiomatic…But there must also be unity within diversity. In the past we emphasized unity at the expense of diversity, and we have paid dearly for it. Let us hope that now we will not move to the other extreme and emphasize diversity at the expense of unity.” [Eshetu Chole, “Ethiopia At the Crossroads…”, DIALOGUE, Addis Ababa, Ethiopia]. The most important question before us is envisaging what a restructured Nigeria would look like. We have agreed that Nigeria needs restructuring based on the principles of federalism. The next big question should be; what should a restructured Nigeria look like? This is what we have set out now to answer in this article. How should responsibilities be shared between the federal and state governments? To answer these questions, we have drawn up twenty rules that should guide us in our debate. Find below the twenty rules that we consider as fundamental to a two-tier system of federal structure and which we think is best suitable for a country like Nigeria. These twenty rules highlight the basic principles of true federalism. There should be two tiers of government recognized by the federal constitution; a federal and state government. Each of them should have a separate constitution. The state government should have the exclusive right to create another tier of government as it wishes. We suggest that a community/city based government be recognized and established by the state as the last tier of government. Community/City based government should therefore replace the existing local government style tier of government. The constitutions must guarantee the autonomy of each tier of government. The community based government should have full control over the most basic things that affect the community. Issues like basic education (management and funding of basic schools), security, water, maintenance, health care, etc should be done by the community based governments. It should also have the right to raise its own taxes to fund its needs. The community based government should be the most empowered tier of government. The federal constitution should limit the federal government responsibilities to only defense, monetary policy, foreign policy, immigration and customs. All duties not given to the federal government should become the duties of the state governments. The federal constitution should be written by the representatives of the already existing autonomous states that now wish to create a federal government. In the same manner, the state constitution should be written by the representatives of the the people, tribes and communities that would make up the state. Ownership of all federal owned assets and institutions that are no longer under federal jurisdiction should be transferred to the states where they are located. Arrangement should be made to ensure that the there is a fair balance of payment for the transferred assets. Where the states fail to offer a fair bargain for the new assets, the general public should be invited to take ownership of the assets. Federal institutions (i.e federal universities) capable of being autonomous should be declared as autonomous institutions and free from federal interference. The federal government will no longer build hospitals, universities, rail lines, refineries, power stations, etc. These shall become exclusive duties of the state governments. The federal government duty shall be limited to the items listed in number 2. The federal constitution shall forbid both the federal and state governments from embarking on business ventures and shall limit their sources of revenue to only taxation and royalties. The federal constitution should recognize the right of ownership of land and natural resources as belonging to communities and individuals and should therefore forbid both the state and federal governments from upturning this inalienable right. The implication of this rule is that resource control will now be in the hands of the individuals and communities and not the state or federal government as it currently is. The state and federal governments should have two independent judiciary with each having its own Supreme court. Right to secession should be enshrined in the federal constitution. Communities/towns should have the right to secede from a state and seek membership of another state within Nigeria while states should have the right to secede from Nigeria and seek membership of another country or form an independent country of their choice. The process of doing this must be by referendum. States should be entitled to receive irregular annual grants from the federal government in the same way communities/towns should be entitled to receive irregular grants from their state governments upon meeting certain conditions. There shall be no more monthly allocations. Parliamentary democracy could be adopted to replace the present presidential executive system. The House of tribes (House of Reps) should be abolished and a single parliament retained comprising of tribesmen, professionals, and town/city/state representatives. The federal constitution shall guarantee the decentralization of the civil service. The federal constitution shall recognize indigeneship and residency as qualification for occupying public offices in both state and federal offices. Both basic and tertiary education shall be the exclusive rights of the state and community based governments. The federal government shall have no business with building and managing basic or tertiary institutions. Power generation and distribution shall also be the exclusive rights of the state and city governments. The federal constitution shall guarantee the autonomy and need for federal, state, community and institutional police system. Federal regulations should be unlimited on matters of security, environment, economy, etc.,. Issuance of licenses (whatever kind be it exploration or social license) should be the exclusive right of the state governments while regulations of such licenses should be jointly done by both the state and federal governments. The federal and state constitution shall guarantee the autonomy of every tier of government in conducting their own elections. Each tier of government shall be solely responsible for the conduct of its own elections without interference. The people of the communities, towns and cities that make up a state shall be solely responsible for electing the state government officials in the same way the people of the state government shall be solely responsible for electing the officials of the federal government. The federal constitution shall separate religion from the state and state from religion. The federal parliament shall be structured in such a manner that a bill can only become law if and only if it receives support from a minimum of 2/3 representatives from each state and not a 2/3 of the general House. The above twenty rules are what we consider as fundamental principles of true federalism as may be applicable to the Nigerian society. Once we are able to establish these rules in Nigeria, Nigeria has become a true federal state! The rules will expand as time goes. How can we Restructure and entrench Federalism in Nigeria? In truth, the people who oppose restructuring are stronger than those who propose restructuring. This implies that (for now), restructuring is a minority call. To restructure Nigeria and entrench federalism, this pattern must change. The Federalists must become the majority! We must begin to sensitize and educate Nigerians on the defects of the present system and the need for them to support the campaign for a restructured system. We must proceed to mobilize the now enlightened Nigerians to get involved in the demand for a restructured system. This demand will include persuading the legislature and executives through overwhelming grassroots mobilizations. And finally, we must participate in the restructuring process. We cannot allow the restructuring process to be hijacked by the same marauding political class who have held the country hostage for the past decades. We the ordinary people must participate in the restructuring process. Legally, it is the duty of the legislature to begin the restructuring process. Unfortunately, the legislature has become one of the biggest beneficiaries of the present skewed unitary system, they will therefore be opposed to any structural change which will likely threaten their existence. It is on this basis that Nigerians must unite to overwhelm the legislature with their demand for federalism. We cannot depend on and expect the beneficiaries of the present system to change the system, certainly, not without a fight! The kind of restructuring Nigeria needs is not cosmetic. For a fact, we do not need a constitutional amendment but an entirely new constitution. At the end of the day, what we desire is a Sovereign National Conference (SNC). To get this, we must unite. Every tribe, every community, every state and every ethnic nationality must unite to demand for a system that works. The time to Restructure Nigeria & entrench true Federalism is NOW! We have seen several political leaders (including those who previously opposed restructuring ) give support the federalism campaign in Nigeria. They now know better. Nigeria might never work without some structural re-engineering. We have said a lot on social media. We have talked, we have written. What is left is for us to ACT. Those who oppose restructuring might (for now) be in the majority, however, a majority of this majority are actually ignorant of what they oppose. If we are able to sensitize them, we the Federalists could become the new majority! We have a whole lot of work to do. The most important focus s is that it is possible. Participate in the restructuring process. We cannot allow the restructuring process to be hijacked by the same marauding political class who have held the country hostage or the past decades. We the ordinary people must participate in the restructuring process. The task ahead is surmountable. We must begin the debate. Disagreements may arise, compromises will be reached and progress will be made. If only we agree to begin the debate. 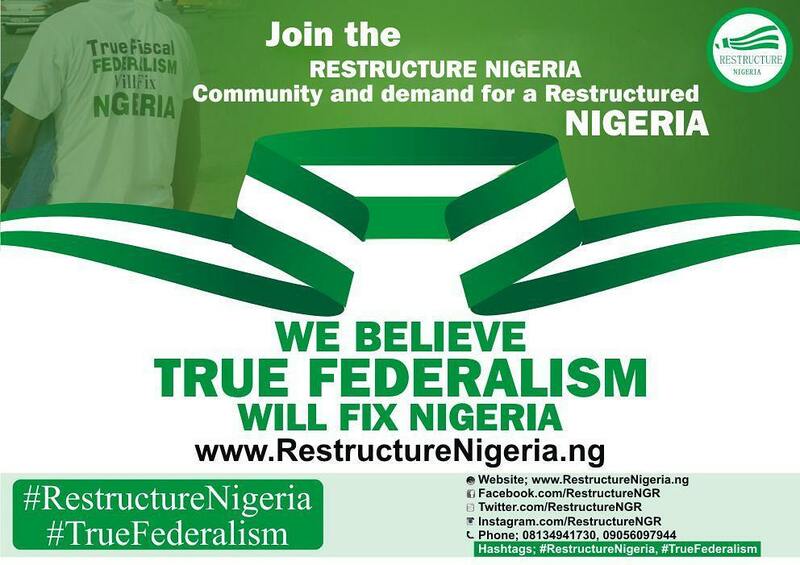 Use the hashtags #RestructureNigeria & #TrueFederalism to promote the campaign on social media. Follow us on Twitter, Facebook and Instagram to learn more about the campaign. Check out our Event section to see when we shall be having a sensitization rally in your neighborhood and city. Visit our online Shop and purchase any of our campaign wears. Purchase for your friends, co-workers and everyone around you. Be proud to be a Federalist and demand that Nigeria be restructured on the principle of true Federalism. each, within a sphere, co-ordinate and independent of one another. c) Each levels of government must be financially independent. to the others for financial assistance. hence, there must be independent judiciary to resolve the case. government should have undue power over the amendment process. developments, elections, judiciary, health care, etc. constitution is reserved for the state government. affairs and with an authority in some matters exclusive of all others. have a horizontal relationship with each other. government, able to stand on its own against the other. government, acting within its powers. authorities, with the central government sitting on top of the others. All governments have a horizontal relationship with each other. It is surprising that Nigeria only operates federal system on paper. republic were aborted by the return of military rule. to carry out the immense responsibilities. became a matter for Regional jurisdiction. of Business Names, and Statistics. only High Courts, but also Regional Courts of Appeal. Commission was the statutory Chairman of the State Commission. the allocation of the proceeds from mineral exploitation. reason that the West is the most industrialized part of the country. exchange earning commodities. In the West, cocoa was found in abundance. the past until it was discarded by the military. countries. Then Nigeria had development plans that guided the nation. federal system even though it claims to be a ‘federal’ republic. that derives its sustenance from the states. them until it can no longer do so. base is limited, and many others. General Ironsi, emerged as the head of state after the first coup. the already charged atmosphere, this action reinforced northern fears. opposition to unitarism that the countercoup of July 1966 took place. maintaining the unitary military system! became a source of contention, however. formally allocated to the states, especially in the area of education. so till date; a unitary system. General) Yakubu Gowon, became the head of state after the second coup. any law court. Most members of the SMC under Gowon were state governors. constitution. Nigeria has remained so till date; a unitary system. restructured and not Nigeria’s political system. they fear Nigeria has never worked and will never work. will be to restructure the country and entrench true federalism. base, the entire country will likely run into crisis. sustainability of economic and political inclusive institutions. federal interference. And many others. development or underdevelopment (its their choice to make). on federal allocations to survive and local communities will no longer. through the people who would then demand for accountability afterward. will fix corruption in Nigeria! the biggest beneficiary of a restructured Nigeria. simply be in charge of their own development. the hands of the local people and away from the politicians. the country and entrench true federalism. restructuring and how is it different from what antagonists think it is. Itsey Sagay gives us an interesting understanding of the concept. persons, matters, services and materials within its territory. many nations, the basis of revenue allocation was strictly derivative. provision was made for excise duty on tobacco. proportion of that commodity that was derived from a particular Region. originated from, clearly buttressed the operating base of. been an integral aspect of Nigeria’s short lived federalism. federal government will be completely eradicated. customs and West African research institutions. Agency shall be a non-political body. cleared and charged to duty. federalism that we should learn from. Let us put it here in verbatim. expense of unity.” [Eshetu Chole, “Ethiopia At the Crossroads…”, DIALOGUE, Addis Ababa, Ethiopia]. is what we have set out now to answer in this article. rules highlight the basic principles of true federalism. should become the duties of the state governments. communities that would make up the state. shall be limited to the items listed in number 2.
sources of revenue to only taxation and royalties. communities and not the state or federal government as it currently is. Right to secession should be enshrined in the federal constitution. meeting certain conditions. There shall be no more monthly allocations. tribesmen, professionals, and town/city/state representatives. community and institutional police system. has become a true federal state! The rules will expand as time goes. the exclusive right to create another tier of government as it wishes. full control over the most basic things that affect the community. the most empowered tier of government. is a Sovereign National Conference (SNC). To get this, we must unite. must unite to demand for a system that works. talked, we have written. What is left is for us to ACT. important focus s is that it is possible. ordinary people must participate in the restructuring process. The task ahead is surmountable. We must begin the debate. be made. If only we agree to begin the debate.